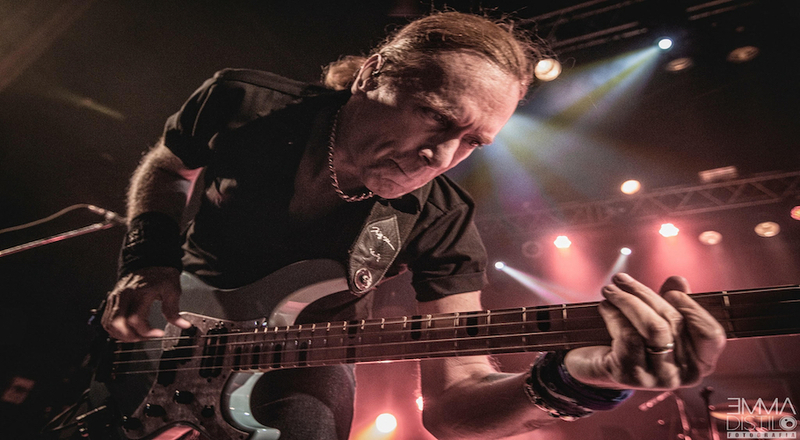 Billy Sheehan has changed the way bass guitar is played. Rising to cult status in the 80’s with his Buffalo, NY based band Talas, Billy was recruited by David Lee Roth when Roth left Van Halen in ’85. He recorded two platinum selling albums with the former Van Halen front man before setting out on his own. Forming Mr. Big in 1989, the band achieved a Billboard #1 single in the US and 14 other countries with “To Be With You” from their 2nd Atlantic Records album release “Lean Into It”. While developing his trademark style of playing he has performed over 4000 live gigs on every continent except Africa and Antarctica. Voted the “Best Rock Bass Player” 5 times in Guitar Player magazines Readers Poll, an honor which placed him in their “Gallery of Greats” (alongside Jimi Hendrix, Paul McCartney, Geddy Lee and Eddie Van Halen to name but a few), he has also won readers polls in Germany, Japan, Korea, Italy, and many other countries. On January 27, 1999 Billy’s handprints and signature were preserved in cement on the Hollywood Rockwalk at Guitar Center. An honor attributed to those artists who have made a significant contribution to Rock and Roll. In Japan, Billy has won the prestigious “Player Magazine” (Japan’s #1 Music mag) Readers Poll for Best Bass Player an unprecedented 14 consecutive times and Burrn! Magazines (Japan’s #1 heavy metal mag) Readers Poll 5 times while selling out Budokan arena 3 consecutive nights with his band Mr. Big. He started the new Millennium 2000 by performing before 40,000 fans with Mr. Big at the Osaka Dome in Japan then began work on his long awaited solo album. With recording completed, Billy’s first solo album entitled “COMPRESSION” was released on April 25, 2001 on the Favored Nations label. On “COMPRESSION”, Sheehan wrote, sang, played Baritone 12 string and 6 string guitar, played bass and programmed drums on the entire record, except for 2 tracks featuring Terry Bozzio on drums and an amazing Steve Vai solo on the song “Chameleon” (the first pairing of Steve Vai and Billy since the David Lee Roth days). Other upcoming records include a new Mr. Big album (their 6th) slated for release in Fall 2001, an all instrumental bass album, an experimental Bass & Drum record w/ Terry Bozzio, and the 5th Niacin album featuring Dennis Chambers on drums (Funkadelic, Steely Dan, and Mahavishnu Orchestra). Niacin is an all-instrumental Bass, Drums, and Hammond B3 band at the cutting edge of a new musical movement.